Heat oven to 400°F. Grease 12-inch pizza pan. Unroll dough; place in greased pan. Starting at center, press dough out to edges of pan. Bake 10 to 12 minutes or until crust begins to brown. In small bowl, mix chicken and barbecue sauce. Spread chicken mixture over crust. 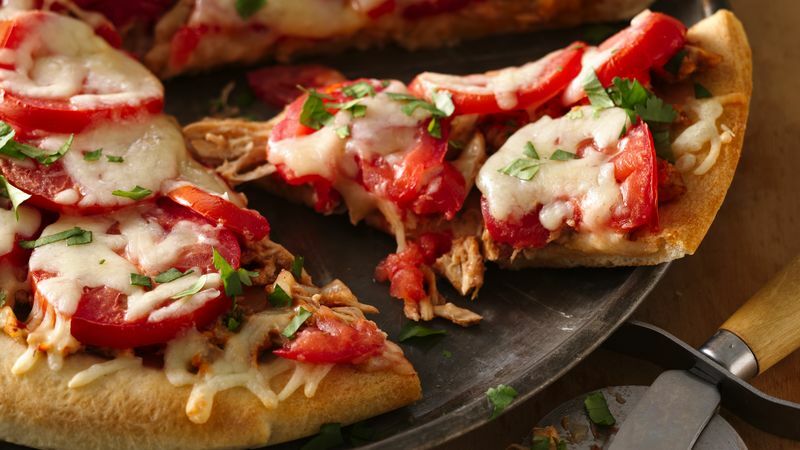 Arrange tomatoes over chicken; sprinkle with cheese. Bake an additional 10 to 12 minutes minutes or until cheese is melted and crust golden brown. Sprinkle with cilantro. You can use about 8 ounces of cooked chicken from the deli, cut into cubes, or 2 cups frozen (thawed) diced cooked chicken instead of the rotisserie chicken.